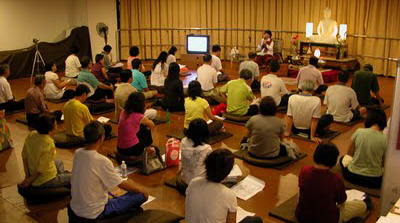 The centre is affiliated to the Mahasi Meditation Centre in Yangon. The centre invites a monk from Myanmar, usually an established senior who can act as a Chief Monk and guide meditators, well versed in the Dhamma and is able to speak English well. The Chief Monk, or Sayadaw, will need to conduct Vipassana meditation classes based on the Mahasi Sayadaw tradition. 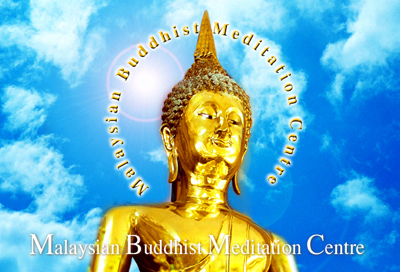 The meditation centre is in Jalan Masjid Negeri. You may get a Rapid Penang bus service of either U206 or 304 and stop at the bus station in front of Convent Green Lane school. The centre is just next to the school. It shares the ground with Wat Nai, a Thai temple that houses several Thai monks with their own groups of disciples. A huge Buddha statue was built in recent years midway at the entrance route to the meditation centre under a Bodhi tree, and one may worship by bringing in candles to give light offering. There are many types of meditation, or rather objects of meditation. The Mahasi Sayadaw tradition is one that was said to be based on the original and most basic teachings of the Buddha, which observes clearly the different conditions of our body. In this method, one may either sit, stand, walk or even lie down. When one is sitting down, the main observation is the rising and falling of the abdomen with every breath taken, and diverting the attention to some other phenomenon of the body if those sensations are stronger than the rising and falling of the abdomen. An example will be the observation of the numbness of the legs while sitting, and the main objective is just to observe and do nothing else, not even to shift the sitting position unless the pain is truly unbearable. Even then, the shifting of position will have to be done slowly and observed completely. The observations will lead one to realise that everything has a rising, and when there is a rising, there will always be a falling. It will never stay permanent, which will then be a support for the idea of impermanence. Most of the time it will be painful too, and even if it is a peaceful sensation, it comes to an end and we may feel unhappy when it ends. This is the support for the idea of suffering. While all these sensations arise, apparently they do so without ever consulting our permission. This is the support for the idea of non-self. These three, impermanence, suffering and non-self, are the basic essence of the Teachings and constantly reminded in the Theravada tradition. There are also food offering sessions during breakfast and lunch. This is called Dana, and usually accompanied by prayer sessions prior to that. In usual practices, the food will be prepared and placed on the table before the monks come to the dining hall for the meals, and chant some prayers for merit sharing before eating. And in some other times, there may be the pindabat where disciples will kneel down and the monks will go round collection portions from them instead. Sometimes the monks may actually walk out of the meditation centre to the market for their pindabat, while during some other special occasions such as during the month of Vassa or rainy season, the pindabat will be done within the temple grounds to make things easier for the disciples. Besides meditation and dana sessions, you may also visit a library at the centre where there are plenty of books of the Theravada practices, teachings and meditation guides. Most are books translated from texts from India, Myanmar and Sri Lanka and may originally be in Pali language, and the translations were done carefully to ensure that there is no deviation and wrong interpretation of the original texts. There are also audio tapes and CDs. This entry was posted in Tourism & Leisure and tagged Malaysian Buddhist Meditation Centre, MBMC, Vipassana Meditation by admin. Bookmark the permalink.